A great Champions League match between Liverpool and Bayern Munich is just around the corner and new 888sport customers can claim a double price boost on this clash! 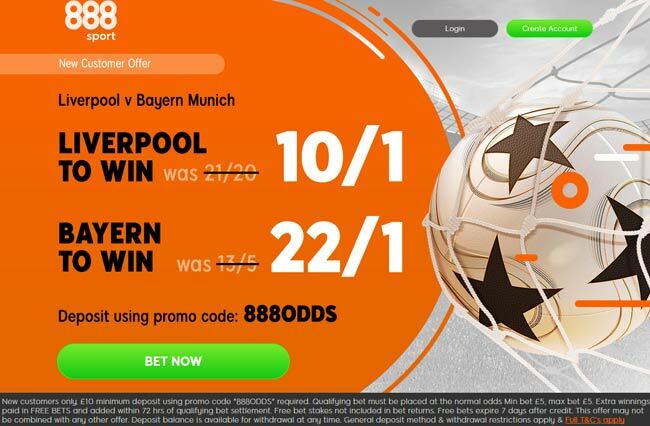 This post explains how to claim 10/1 Liverpool or 22/1 Bayern to win at 888sport! Max bet £5! Liverpool have a 100% winning record at home in Champions League this term. The 3-2 win over PSG could have been a wider margin, they put four past Crvena Zvezda, and beat 1-0 Napoli in the deciding match. Bayern are unbeaten in the last eight away matches in Champions League. The Bavarians enter this clash on the back of a run of nine wins in ten league matches, and they are still on course to win the DFB Cup. Who will claim the bragging rights? Choose your price boost at 888sport! 888sport offer 10/1 Liverpool or 22/1 Manchester UTD to win! Max bet £5! Don't miss our Liverpool vs Bayern betting preview with predictions, betting tips, probable lineups, team news, enhanced odds, exclusive promotions and no deposit free bets on the Champions League! £10 minimum deposit required. Deposit balance is available for withdrawal at any time. Qualifying bets must be placed at normal odds. Min bet £5, max bet £5. This promotion may not be combined with any other promotion. "Get 10/1 Liverpool or 22/1 Bayern to win at 888Sport (Champions League Enhanced Odds)"